MD-type wire rope hoist is two-speed electric hoist compared to CD electric hoist, there are fast and slow speed, especially for fine handling working places. With the advantages of extensive use, compact structure, design and manufacture size equalization, parts versatility, easy operation, etc. it can be not only installed separately on I-steel beam, but also can be installed in single-beam, double-beam, cantilever and gantry cranes. 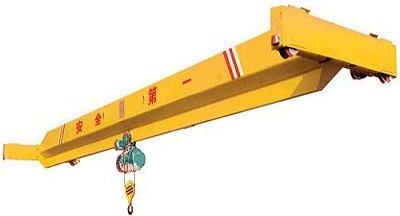 MD-type wire rope electric hoist has two lifting speed, high and low speed ratio is of 1:10, and it is especially suitable for occasions require fine adjustment work. 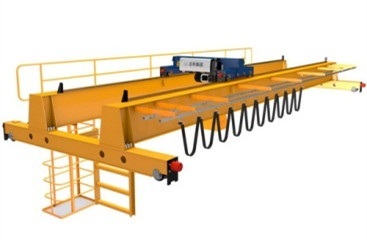 Electric hoist is also including fixed and run type, fixed type electric hoist often supporting the use with electric hoist double girder overhead crane. 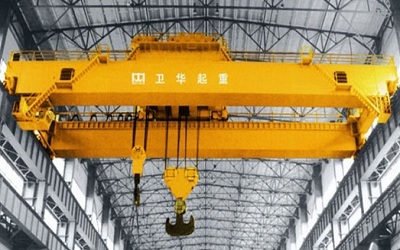 Run type electric hoist supporting the use of electric single girder crane, electric suspension crane, gantry crane, jib crane and others, constituting a variety of hoist cranes. Our company has nearly 30 years of production and design history of electric hoist, has accumulated a wealth of experience in electric hoist design and production, and can also design and produce non-standard electric hoist adapt to various conditions. MD-type wire rope electric hoist is mainly composed of: Double-lifting motor, reducer, drum device, hook set, electric control system, traveling trolley, safety devices and other components. ZDS 0.8 ~ 13KW motor is conical rotor motor with two-speed slow and fast, slow and fast speed ratio is 1:10, standard motor insulation class B, protection class IP44, can be also made F&H- insulation class and IP54&IP55 protection class according to conditions requires. The motor has such characteristics: good heat dissipation, long life use, safe and reliable, can work long hours at high intensity workplace. 1. Box and box cover processed by good anti-vibration performance cast gray iron HT200. Using high quality rubber ring during gear motor assembly, effectively prevent oil leakage. 2. 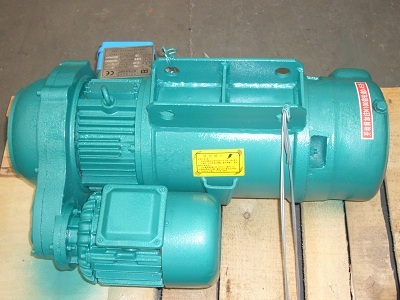 Gear and gear shaft is precision machined by low-carbon alloy steel 20CrMnTi. Reach the standard of large carrying capacity, high torque transfer. Drum device consists of drum shell, rolls, intermediate shaft, guide rope device and limit guide rod device. Reel device installed lifting reducer in the left, hoisting motor in the right. Drum through the right bearing cap fitted on the front part of the lifting motor. Through flexible coupling, intermediate shaft and rigid coupling, the motor shaft input the driving force to speed reducer shaft end. The drum fitted with guide rope on it. Hook part have two types same with CD electric hoist: Single pulley type and double pulley type. Hook set material is DG20, safety factor is greater than 5. Trolley traveling mechanism includes driven traveling trolley and driving traveling trolley. Traveling trolley composed of traveling motor, reducer, wallboard, driving& driven wheel set, flat nut, bolt and adjusting pad. Electrical part of MD electric hoist controlled by the control box. Electrical components in control box generally including CHNT, Schneider, Siemens and other brands of low-voltage. Power supply is three-phase less than 690V, frequency of 50 ~ 60HZ. Electrical control type includes switch direct control and inverter frequency control. 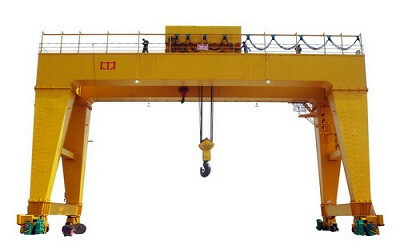 MD-type wire rope hoist operations including: cable handle ground operation and remote control operation, both have two-speed (slow and fast) operation. It even can be installed with cabin operation. MD-type wire rope hoist protection functions including: overload protection, the upper and lower limit protection, no-voltage protection, ground fault protection and short circuit protection. Within operator walking distance and sight range, there should be no obstructions and heavy floating debris on the route the lifting weight traveling through. Up and down, left and right directions action of hand control buttons should be accurate and sensitive, motor and reducer should be no abnormal sound. Brakes should be sensitive and reliable. There should be no foreign matter on the hoist traveling orbit. Up and down limit action should be accurate and sensitive. Hook rotation should be flexible in the horizontal and vertical directions; hook pulley should be with flexible rotation. Wire rope should be no obvious cracks, neatly arranged on the reel, no appearance disengage the pulley groove, chaotic twist and fold, etc. with good lubrication. Electric hoist working environment temperature is -25 ~ + 40 ℃. Electric hoist shall not be side loading heavy objects, overload use is forbidden.